Are you still stuck in the times of yesteryear where marketing simply meant running a billboard, buying airtime on TV or ads on the local radio station? Or what about letterbox drops and junk mail, or the trusty old yellow pages? If you answered yes to any of the above, then it’s time we took you on journey into the new millenium! What used to be considered effective marketing, quite simply, isn’t anymore. But, if you’ve been spending money and resources on some of the traditional media we just mentioned, you probably would have figured that out by now all on your own! Digital marketing is the proven go-to method for all industries, but we’ve seen some particularly impressive results when digital marketing in the dental industry. The goal of marketing, be it traditional or digital, is to reach new patients and to create new revenue streams. The main difference between the two, is that with traditional you’re shouting out in a crowded room hoping someone will hear you. And in the digital world, you’re speaking directly to those that are waiting to hear from you. Directing your marketing efforts towards those seeking your services, well, that just makes sense. Not only is digital marketing completely targeted towards your prospective patients, but it’s also entirely measureable so you can put your money where your mouth is every single time and make sure you’re actually producing positive outcomes! You can easily track your ad performance and see where your traffic is coming from, and then use these insights to further improve your marketing efforts. There are three Pay-Per-Click (PPC) categories in digital marketing and these are search, social and display advertising. A good balance of all three will maximise your digital efforts. 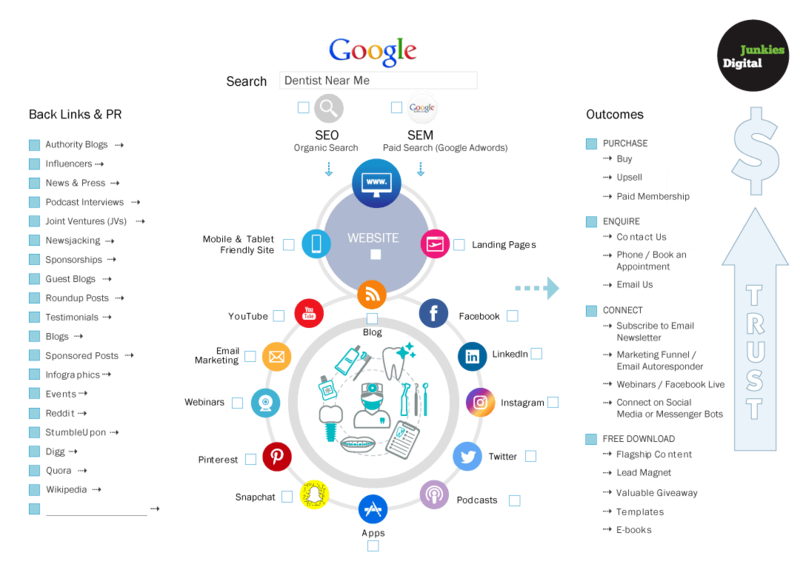 PPC allows you to use platforms that will deliver your content directly to your potential patients. They’re not free, but when done right, can grow your number of prospective patients hugely! 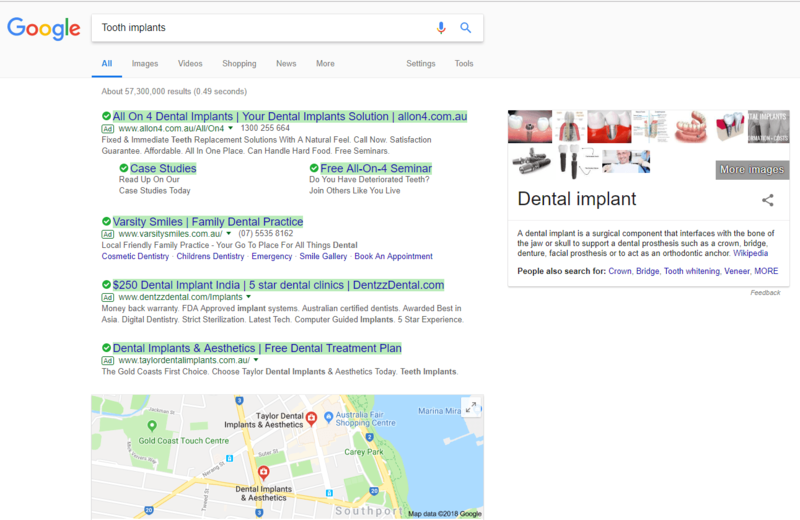 PPC ads are a great way to advertise your practice even to those who have not heard of you yet. When you build a PPC campaign, you can control your message and can monitor the performance of your efforts. The key lies in creating a consistent and well-crafted message that really speaks to your target market. PPC is not to be confused with paid search ads, which you are likely to have seen many times before! Paid search ads, or Search Engine Marketing (SEM), are online ads that appear in the search results of platforms like Google or Bing. 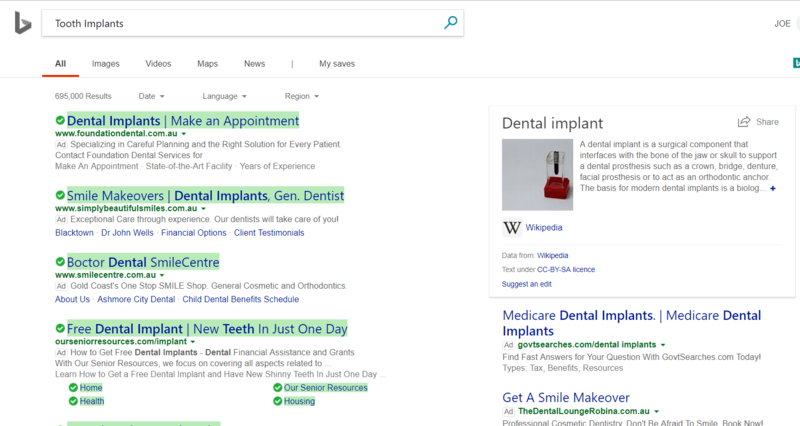 When somebody uses a major search engine to look for a service or product, paid search ads are those that appear in the top areas of the results page. SEM is focused on results that are intent-based. For example, you are marketing with the intention of having potential new patients. This is a great way to advertise because you are giving the audience the thing or service they are looking for. But how do you get into paid search ads? Paid search ads use a PPC advertising model wherein you pay the search engine for traffic whenever your ad is clicked. These are advertisements that appear on Twitter, Facebook, Instagram and other social media platforms. You can pay these platforms to promote your dental practice via promotions, offers and boosted posts. Through social ads, you can target relevant audiences through set parameters like personality, behaviour and other demographics. These are the ad boxes found on the top or sides of websites. Paid display ads are either banners or videos and you can see A LOT of these in news websites. Before you can view the content you came for, you are made to watch a few seconds of a commercial first. It can be intrusive to the audience but effective for the marketer. Landing pages lead generation for dentists are not to be confused with a website’s homepage. These are web pages that a person reaches after they click on an ad with the sole purpose of receiving ad campaign traffic. A landing page should be relevant, clear and direct. It’s the page where a potential patient hears what you want them to hear about you so it’s important to make a good first impression. Native Advertising: This is paid digital content that appears on another site that is somewhat related to your business and provides information that your shared audience would want. For example, If you want to advertise a “teeth whitening promotion” you might consider advertising on beauty magazines like Redbook or Vogue. Video Ads: These are one of the best ways to market your dental practice because it allows you to talk directly to your potential patients. You can show them around your clinic, provide educational “how tos” or even let them hear from your current patients. Video is a growing platform in the digital space and it’s starting to make up a large portion of advertisements online. This is the cheapest form of communication in digital marketing; all you need is an email marketing service provider and an email list to get going! Through email marketing, you can send targeted emails to a customer list which could include newsletters, promotions or reminders. Not everybody who visits your website becomes a patient. There are those who are still on the fence about booking an appointment. With remarketing, these fence sitters get reminded about you by seeing your ads in the sites they’re browsing, over and over again. It’s a really great tool for building brand recognition and value for new potential patients.